Inspiration or being inspired is important if you want to create, paint, or write. Writing means books, even a diary or anything that you could pass on to the next generation. All that is good, but what is more interesting is the reason of that inspiration that causes for something wonderful to be brought to life. After watching Haifaa Al-Mansour’s “MARY SHELLEY” who became the first Saudi female director ever to direct a Hollywood film, you learn one thing: never expect to come up with something outstanding unless the life you have is chaotic, nightmarish and hectic. If that is so, then prepare yourself for a delight of the imagery that will start dancing somewhere deep in your mind to fight its way through to come to the light, like a little child who for the first time greets life. 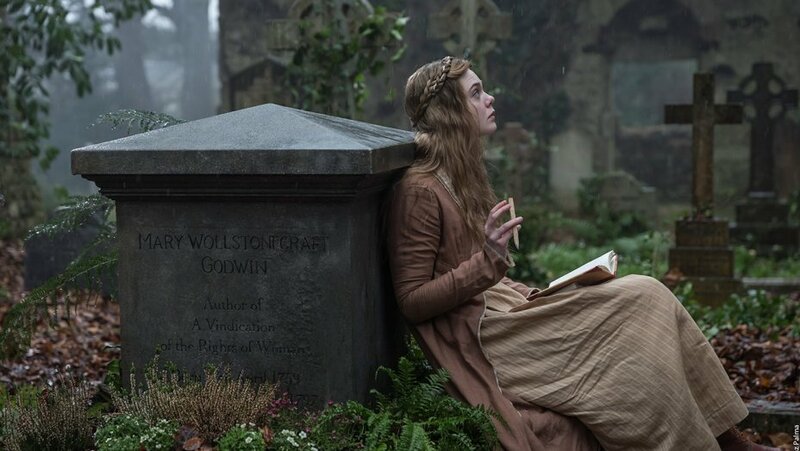 Film set in London’s 1813 and follows the title character Mary Shelley (Elle Fanning) and her love affair with romantic but radical poet Percy Bysshe Shelley. During their stormy relationship, ups and downs inspired the young woman to write Frankenstein. But before the woman reaches the moment when she starts penning her novel, she will have to go through all possible struggles to realize the importance of finding her voice even at those times when she barely could hear herself. Her father William Godwin believed in education. He trusted Mary and notices her love for writing which results him sending her to Scotland where he hopes she can find her refuge and learn to describe the images that are in her mind. It was in Scotland, at the party, drunk but with a charismatic look, Percy appears at the entrance of the mansion. It was a moment when Mary sees him right away and even falls for. But the letter she receives from England were alarming, as she was set to depart back to London. When Mary learns that her sister Claire was pretending to be ill to see Mary again, this might upset the young woman for a second, but quickly awards her for her effort to have her sister back. To Mary’s great surprise, Percy follows her when shorty after Mary Godwin officially declares her love for Percy at Mary mother’s graveside in the cemetery despite knowing that he was just recently estranged from his wife and his daughter, at his still young age of 21. The dynamic of the film amazingly advances from rain to hurricane with all possible implications. “Idealism and love recur. But nothing can prepare you for a man like him.” – says Percy’s wife to Mary. But those words did not have a significant impact, as Mary was prepared to learn everything all by herself. The interesting pace in their relationship turns to a complete different direction when apparently Percy was totally fine with an open relationship. And when he hears about his friend advancing to Mary, the man gets angry at Mary questioning, “I thought this is what you needed from our relationship. A free love. And freedom that is important to have, the same way I do.”, he adds. Overall, “MARY SHELLEY” grabbed my attention entirely. In some scenes, it was interesting to observe when actors never distanced themselves from characters they portray. Douglas Booth as Percy Shelley who was mostly drunk delivered a fine performance. He found that common ground to match Elle Fanning’s immersive acting skills, If I knew where she gets that ability from. Tom Sturridge as Lord Byron is something you would love to re-examine all over again. And Bel Powley as Claire Clairmont who had no troubles in portraying another charismatic character who enjoyed having a scandalous reputation but never lost that subtle connection with Mary Shelley she had. In conclusion, “MARY SHELLEY” is an interesting romantic period drama, where you will find more drama than romance. But that was intentional though. It gave a refreshing look into the struggle of a new author, who in order to get published needed to have some famous name on the book as an author, such as Lord Byron or Percy Shelley. But before signing any papers, they must agree that they will never talk about it and will always pretend that book was written by anyone but them. In the end, costume, soundtrack and direction was at the top. The film itself had no gaps, and the lines written were intelligent and sometimes wicked. “Women are intelligent enough to follow what I say, but not intelligent enough to form an idea. Now, Miss Godwin you have a chance to prove me wrong” says Lord Byron to Mary Shelley. Despite his criticism, he was right. It was a moment when Mary Shelley gathers herself and begins her most fascinating journey, when she knew an opportunity has arrived to create a masterpiece out of chaos. And she, like no one else took advantage of it to write what’s now known as Frankenstein. I agree with your conclusions and loved the film a tiny bit more at 4 out of 5 stars.